The King of Ashes Stirs! Deep beneath the streets of Cadwallon, a long-forgotten network of tunnels and catacombs sprawls in all directions - a city below the city! The Mages of the High City have long prophesied a day of turmoil and darkness, when the earth shall be split asunder and the darkest secrets of the city revealed. That day has come! A terrible tremor shakes the earth, unleashing poisonous fumes from the bowels of the city. As the dust clears, entrances to the catacombs are revealed and rumours of uncountable wealth fly through the guild of Thieves. Somewhere deep in those twisting passages is the fabled treasure room of the dread King of Ashes. Will your gang be the one to uncover its secrets... or will its deadly guardian and unspeakable curses be your doom? 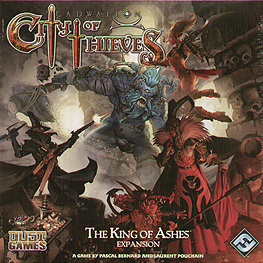 The King of Ashes is the first full expansion for the fast-paced game of cunning thievery and ruthless skullduggery - Cadwallon: City of Thieves! All new challenges await you in your quest to get rich or die trying. Secret intrigues, reinforced militias, bloodier combats, and dark, sinister catacombs can all be found within. Fortunately, cunning new tools of thievery are on hand to help your most experienced thieves finish the job! Do you have the courage to face these new threats? Will you brave the dangers of Cadwallon's long-lost catabcombs? Can you lay claim to the glittering treasure of the King of Ashes?